Welcome! 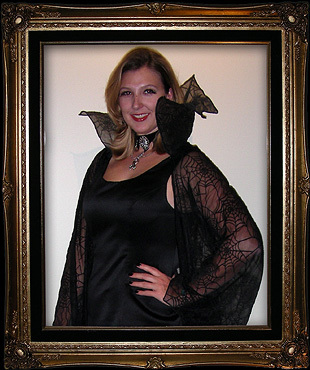 I am Britta, Webmistress of the Dark, and these are my Halloween Recipes! 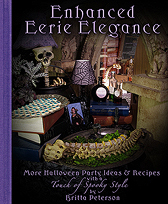 Enhanced Eerie Elegance: More Halloween Party Ideas & Recipes with a Touch of Spooky Style is the next essential Halloween party book! Building on ideas and concepts presented in the first Eerie Elegance book, with new techniques from the quick and easy to the elaborate and challenging and everything in between, you too can elevate your party with Enhanced Eerie Elegance! To order your copy, please visit www.EerieElegance.com! Both books include exclusive new recipes not available online, such as Mojitoes, Batato Chips, Savory Spiders with Gooey Guts, Magical Mandrakes, Violent Vertebrae, Donut Be Scared Peekaboo Pumpkins...and more! are copyrighted and may not be published, broadcast, rewritten or redistributed without prior written consent. Not only are the costumes and decorations fun for Halloween, but I always have to see what creepy, ooky, or just plain visually disgusting party food I can make that still tastes yummy. I think it goes with the spirit of Halloween as a holiday, but not everyone shares my die-hard enthusiasm. Many of my friends can't get past the visuals to find out that what I've made really does taste good, but I can give credit that at least most of them give my eerie eats a try. I've been making the Gelatin Eyeballs since 1994, but my friends are often too chicken to eat them! The Eerie Eyeballs, Bizarre Brain, and Haunted Human Heart are featured separately in this list. The bleeding hands are made in the same way as the Haunted Human Heart, just using peach gelatin with evaporated milk as the flesh, with the same raspberry blood syrup in a baggie bladder inside. The green substance in the large jar is an assortment of Gummy Body Parts purchased candies suspended in green "ectoplasm" soft-set lime gelatin. Deliciously disgusting! I made my original Eerie Eyeball recipe the same way for years, and since I would multi-task stirring the eyeball goop melting the marshmallows and cream cheese while doing other party prep tasks, I never realized how long it really took until I filmed it. I was horrified and vowed that I would simplify the recipe! Here is an easier recipe that does not need a double-boiler or hand mixer and melts much more quickly, but also includes an easier painting technique. Bloom gelatin first in tepid water. Put cream cheese into saucepan over medium heat and stir until smooth. Add marshmallows and stir until completely melted. Using marshmallow creme instead of mini marshmallows makes it melt even easier. After cream cheese and marshmallow mixture is smooth, stir in the bloomed gelatin until completely combined. Add the cold pineapple juice last, mixing again until smooth. The goop will be very runny, but after chilling it will set up into eyeball texture without being too chewy. Pour into molds and chill in fridge until set. 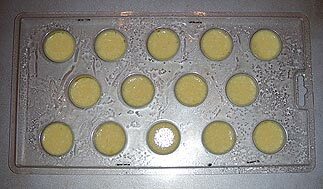 You may still use the original melonballer technique to scoop eyeballs from a deep container after setting, but molds are much EASIER. This full recipe makes 9 dozen truffle-mold eyeballs, however this new recipe can be easily divided in half! After eyeballs are set, gently unmold and arrange on the serving tray. Set out food coloring on a plate or tray. Use the watercolor brush to spread a good layer of iris color large enough for the back opening of the piping tip. Dip the back opening of the piping tip into the food coloring and twist. Aim center above one eyeball, gently lower onto the eyeball surface, and gently twist to apply consistent color in a full circle. Use the watercolor brush to gently brush lines from the circle inwards, leaving white space towards the center. Dip the back of the pen into black food coloring, making sure none will drip. Gently lower the pen into the center of the painted eyeball, twisting gently to transfer all the black in a clean circle for the pupil. If the eyeball surface isn�t smooth, gaps may appear in the pupil, then you can touch up with the brush if you like. Refrigerate until you are ready to serve to your eyeball eaters. If you can't find candy molds, the previous eyeball recipe and techniques are here below. 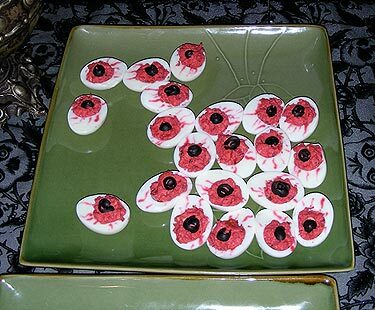 In the early days of my first Halloween parties, I wanted to serve eyeballs that had real squishy eyeball texture instead of the common cocktail onion or deviled egg with green olive iris. My mother had a vintage recipe for a layered gelatin dessert that had a chunky pineapple cream cheese layer, so with experimentation that old recipe was transformed and refined into these Eerie Eyeballs, debuting in 1994. Those brave enough to pick up the squishy eyeball off the plate are rewarded with rich pineapple cheesecake flavor. I used the melonballer technique for years, but it is so much easier to use the truffle candy molds, and at only $2 each mold, you can easily buy enough molds to reuse each year and make your eyeball-making life much easier! Dissolve lemon gelatin in 1 cup water in double boiler. If you don't have a double boiler, use a metal or glass bowl that fits in aon pan of boiling water. Add marshmallows and stir to melt. Be patient and keep stirring since this will take awhile until the marshmallows are completely dissolved. Remove from heat. Add pineapple juice and cream cheese. Beat with a mixer or whisk until well blended. Cool slightly. If you have truffle candy molds or round ice cube trays, spray them with non-stick cooking spray first, then pour the mixture in the molds and leave to set in the refrigerator. Otherwise pour into a deep ceramic dish and chill until thickened and firm enough for scooping into eyeballs. Using a melonballer, scoop full balls of the mixture and set aside for decoration. If you are using the melonballer method, you might need to add one package of plain gelatin powder to your mixture. The molds work fine with just the lemon gelatin to make gently squishy eyeballs. To decorate the eyeballs, use liquid food coloring and an old detail paintbrush and get creative. You will need black food coloring for the pupils. Do not use food coloring pens because they will rip the delicate surface of the gelatin. Start with your iris color, paint the outside circle of the iris, then using as dry a brush as possible, pull the brush from the circle edge inward, getting lighter towards the center, and leaving white space between brushstrokes for the striated effect of a real iris. Paint all the irises, then the first eyeballs will be dry enough to start adding the black pupils. 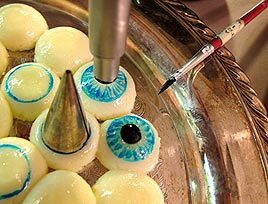 Refrigerate until serving, but remember that the longer your decorated eyeballs sit, the more the coloring will bleed into the gelatin and your detail becomes fuzzy. Wash your brush well and keep it as your food decorating brush. You can paint whatever colors you like for the irises, but I keep mine all the same color to save time, plus I have a good story why. I was asked once why all my eyeballs were blue, so I informed them that after freezing the melanin breaks down so no matter what the original color, all eyeballs become blue. I know this from years of dissecting cow eyes with my teacher mother since all those brown cow eyes became blue, but it was even more shocking to my guests that I even knew that fact! I did find rubber ice cube trays that worked beautifully with much less waste than the melonballer technique. I sprayed the rubber trays with non-stick cooking spray beforehand like you would any gelatin mold, let the gelatin mixture sit in the refrigerator to set, then I was able to carefully pop the eyeballs out to paint them. Some of the eyeballs did break, and they do have one flat side, but that works well, since then they don't roll around while you are trying to paint them. The ice cube holes were deep enough to be difficult to clean, and I learned the hard way they were not dishwasher safe. Since 2001 I have found that truffle candy molds are even better, since the swirl design on the top is the right size for the cornea shape on the eyeball. 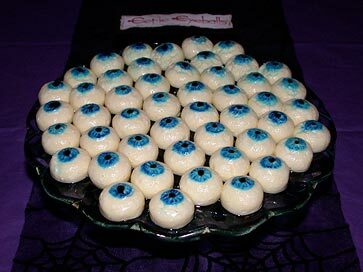 When using the truffle molds, one recipe makes about 9 dozen eyeballs, which is plenty for a party crowd! Over the years many people have developed their own recipes for edible fingers. I found the original Creepy Witches� Fingers recipe long ago on the Searchable Online Archive of Recipes, which has now moved to Recipe Source. The original recipe listed baking powder in the ingredients but baking soda in the instructions. After years of using baking powder just fine, when moving to a different oven, my witches� fingers kept puffing during baking, which was highly disappointing to say the least. I realized that the dough was very similar to a Christmas cookie recipe I had, so I just used neither baking powder nor baking soda and had a more shortbread-like recipe that keeps the detail perfectly, since it has no leavening. I now use my adapted recipe and it works every time. I have also experimented over the years with different fingernails, whether whole almonds with the skin intact, blanched whole almonds, or almond slices. I like the contrast of the whole almonds with brown skin against the pale finger cookie better than the pale spookiness of the blanched almonds, and I often prefer the almond slices as more diseased fingernail effect, but it depends on how I feel that specific Halloween season. I like the clean disembodied finger look, reserving my bloody gore for the gelatin body parts, but you can use red gel icing for bloody stumps and bleeding nail beds if you like. You may also use food coloring in the dough like a few drops of green if your idea of a wicked witch comes from somewhere over the rainbow. In bowl, beat together butter, sugar, egg, almond extract and vanilla. Beat in flour and salt. Cover and refrigerate at least 30 minutes. Working with one quarter of the dough at a time and keeping remainder refrigerated, roll heaping teaspoonful of dough into finger shape for each cookie. Squeeze twice along finger length to create knuckle shapes. Press almond firmly into one end for nail. After arranging on the lightly greased baking sheets, make slashes with a paring knife across in several places to form knuckles. Clusters of three slashes for each knuckle looks best. Bake in 325 F (160 C) oven for 20-25 minutes or until pale golden. Let cool for 3 minutes. Lift up almond, squeeze red decorator gel onto nail bed and press almond back in place, so gel oozes out from underneath. You can also make slashes in the finger and fill them with "blood." If you are opting for less gore, you will still need spare icing to glue the almond nails to the cookies after baking, since otherwise they fall off too easily during storage and serving. When cool enough to stay intact, remove fingers from baking sheets and let cool on racks before storing. Repeat with remaining dough. Baked cookies will keep in an airtight container for at least two weeks. Unbaked mixed dough can be kept refrigerated for at least a week. Arrange for serving attractively on a plate, reaching up out of an urn of chocolate cookie crumb dirt, crawling out of a basket, or your own creative idea. Preheat oven to 200F. Line cookie sheet with brown paper bag or parchment. In a medium sized bowl at high speed, beat egg whites, cream of tartar and salt till fluffy. Gradually beat in sugar. Add vanilla. Place in pastry bag fitted with a medium plain piping tip. Pipe 3" bone shapes onto parchment or brown paper bag. Bake 1 hour until set. Turn off oven, dry in oven 1 hour. Be sure to store in airtight containers or they will become soggy. Makes 4 to 5 dozen small finger-sized bones. Heat soup, undiluted, and mix in the cream cheese. Stir in softened gelatin and blend well. Fold in remaining ingredients and pour into a lightly-oiled mold. Chill until firm and serve with your favorite crackers. I originally found this recipe for MardiGras 2000, which was quite yummy. When I got a brain mold for my birthday - can you tell my friends know I love Halloween? - I started thinking of what I could use for making a brain. Since the brain mold is only about 3 cups, I halved this recipe except for the amount of gelatin, left out the green onions, and finely chopped the shrimp in a food processor into more of a paste for the sake of making it look more smooth-textured like a real brain. Makes about 3 dozen bite-sized appetizers. 1 package crackers, melba toasts, bagel chips, or be creative! Cut the smoked salmon into small thin strips. Spread a dollop of cream cheese on each cracker, then place a strip of smoked salmon curled on top of the cream cheese. This is another standard tasty appetizer just renamed to be gory for the season! Set the cream cheese out to thaw to room temperature. Line the inside of the plastic skull dish with plastic wrap leaving enough edges to wrap around later. Spoon the softened cream cheese into the plastic-lined skull dish, mashing in as much cream cheese as possible to pick up the most detail in the mold. Scrape any extra cream cheese off the top so it is flat. Close the plastic wrap over the flat cream cheese top and place in the freezer to set. Once set, remove the plastic wrap from the skull dish, and carefully wrap in foil to cushion the face shape. Line the skull dish with fresh plastic wrap to make more cream cheese skulls. Store in the freezer until night before the party, then thaw in the refrigerator. 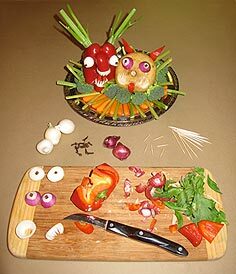 To serve, place the skull in a shallow dish, garnish with your preferred bloody salsa or chili mixture, including inside the eye sockets, and stab with your favorite spreader. You can extend the time before needing to refill by placing the skull on half a block of cream cheese, but cover the plain cream cheese with enough sauce so you can only see the skull above the "blood." Inspired by the traditional Cambodian delicacy, in 2003 I tried making my own Fried Spiders out of pre-made ingredients. They are quite fragile, but tasty! Thaw the jalapeno poppers and onion rings enough to be able to use toothpicks and knives on them. Cut the onion rings in half to make the curved legs. Attach the 8 legs to the jalapeno pepper body with egg wash and hold in place with the wet toothpicks. Bake in the oven according to the jalapeno popper package instructions, taking care not to burn the legs. Carefully arrange on a serving platter, since the legs might fall off, just like real fried spiders! This isn't so much a recipe as it is a creative display. Arrange the blue corn chips in a coffin in the shape of a long-dead corpse. The natural blue corn chips have almost a dusky shade of brown in them that hints of decayed skin. Serve with a nice blood-red chunky salsa as accompanying entrails. If you cannot find a coffin, find a clean plastic skull or assorted bones, put them in a large serving bowl, then arrange the blue chips around the bones as the decaying flesh! Divide dough in half (or sixths). Only add milk or water if the dough is too dry. Chill 1 hour. Roll out half of dough 1/8 to 1/4 inch thick. Place on a greased cookie sheet and bake at 375F/190C for 12 minutes. These can be frosted. Makes about 5-6 dozen standard-sized cookie cutter shapes. Thanks to Kathy Henricks for her tried & true frosting recipe! Beat 5 to 10 minutes with a power mixer until very smooth. Water down a small amount for a crumb coat if frosting a cake. After 20 minutes (when set), frost with remainder of frosting. When set, use paper towel or typing paper to set desired surface texture. This is fluffy enough to frost easily, yet stiff enough for keeping its shape for decorating. For the Ghoulish Gravestone cookies, use the Spooky Sugar Cookies recipe with a gravestone cookie cutter, bake & cool completely, then cover with Royal Icing, but tint the icing gray using a small amount of black food coloring, then add just enough light corn syrup for the icing to level itself when spread, but so it still hardens enough to use food coloring pens for the lettering. Be sure to wait a full day or at least overnight for the royal icing to harden completely before using the food coloring pens. Food coloring pen sets have become available in most large grocery stores with the cake decorating supplies, plus specialty cake decorating stores or online. If you cannot find any, use a fine, soft watercolor brush and normal black food coloring. You can use any lettering style you like for your gravestone epitaphs, and you can vary your font styles as you wish. If you are overwhelmed by the concept of free-hand lettering, print out your epitaphs from your computer in fonts you like and the layout centered to your preference, then use those as models to draw on the cookies. I say "draw" because elaborate lettering by hand is much more like drawing than writing, since you are placing each line for the end result image, not just writing quickly to get words down. I hadn't made gravestone cookies in the past since the only cookie cutters I found were the simple upside-down U shape, which I thought too boring, but I found a more elaborate cutter the same year I made my first outside gravestones, so I thought the theme very appropriate! My first year I wanted to be sure the epitaphs were legible so everyone would get the jokes, which they did, and I was going for a simple carved style. The next year I kicked myself because I've been good at free-hand calligraphy since I was 9 years old, so why not go all out with the lettering? I chose a consistent Old English blackletter font style since I liked the look and can do it in my sleep since I've done it free-hand so many years now. Since I hadn't used the "punny" epitaphs for my yard gravestones, I used them on my cookies, using the same 13 epitaphs that made me laugh the most for the entire batch of cookies. The only drawback to making these cookies every year is that in only 4 years my black food coloring pen has already run out of ink! This is the traditional recipe that glues gingerbread houses together or makes a hard candy-like surface on cookies or cakes. Makes enough to ice 5-6 dozen sugar cookies. Beat until peaks firmly hold their shape, and the more you beat it, the firmer it gets. This hardens when exposed to air, but dissolves in water, so keep a moist towel over the bowl while working with it. Use a tight-fitting plastic container to store in the refrigerator for a couple weeks, but the egg whites begin to separate from the sugar any longer than that. These edible spiders are made from Royal Icing, which needs to be used right away since it hardens to a rocklike texture very quickly! Mix up the Royal Icing per the recipe, and add black gel food coloring to get the mixture as dark as you can. It will dry a darker color than your wet icing looks. I only made a third of the Royal Icing recipe and I still had tons of icing left over after making two dozen spiders. These are very fragile, especially peeling off the waxed paper, since the legs tend to break off. Place gently around your party table for a spooky look, but if you place near moisture, you might have a black food coloring mess that will be difficult to clean! I used a decorating tube to pipe the icing into spider shapes on waxed paper. If your hand gets sore from piping spiders like mine does, put a toothpick in the piping tube nozzle so the icing doesn't dry and plug the nozzle. Taking breaks is good since the warmer the icing gets, the bigger and sloppier your lines are, so let the icing bag rest back to room temperature, then keep piping away until you get sick of spiders! For me that's usually about 3 dozen, or one cookie sheet full, and usually happens over the course of several days while watching TV and waiting for other Halloween recipes to set or bake. Once the spiders are dry, as long as they stay away from moisture, they will keep indefinitely. TIP: If you are also icing cookies with Royal Icing, make one large batch, reserve about 1 cup in another bowl for your spiders and tighly cover. Thin the rest of the icing with corn syrup for smoothly-iced cookies, then you still have your stiff Royal Icing ready to be tinted black for spiders! These were originally from the Hogwarts Celebrations, now appearing annually for Halloween by popular demand! Makes about 3 dozen miniature pasties. 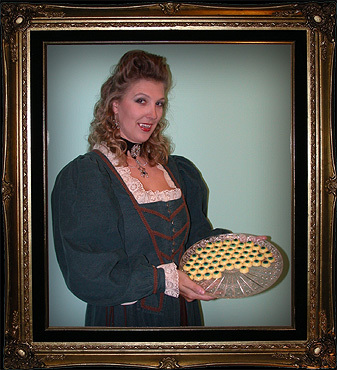 Bake the pie filling only (no crust) in a large greased casserole dish in hot oven (425F) for 15 minutes. Keep oven door closed and reduce temp to moderate (350 degrees F/180 degress Celsuis) and continue baking for 45 minutes or until table knife inserted in center of dish comes out clean. Cool on wire rack. A spin on a traditional Halloween treat of caramel apples without all the mess! Cut the apples into slices if not already. Vivid blood-red apple skins against the snow-white apple flesh look fabulous on a Halloween table, with the caramel "golden goo" ready in a bowl for dipping. For carving faces, it is best to have contrasting skin compared to the inner fruit, like Bosc pears for their nice brown skin, or red apples. As long as you have one or two faces growling in the center, you can arrange the rest of your favorite fruit any way you like. If you are very lucky, you might find baby kiwi, since when cut in half across, they look like eyeballs! Remember that many fruits will turn brown when exposed to open air, so wait to carve until right before serving, or brush exposed areas with lemon juice to keep them from turning brown. Vegetables are a little more flexible than fruit since their cut surfaces last longer exposed to air, but they still won't last more than 24 hours without starting to change shape and wither. Jicamas are great because they have natural knobby faces you can enhance with your carving. Get inspired by the shapes you see, For instance, the curved corners of a red pepper can become devil horns. Cut pearl onions in half for googly eyes and poke a whole clove in the center for the pupil. Trim layers of white onions into teeth to add as a mouth. Break off toothpicks into smaller lengths to anchor pieces together. Celery tops can become beastly antlers, and spiky teeth are always scary! Yes, another nasty name for an otherwise mediocre dried fruit...but call them "scabs" and all of a sudden no one will eat them! This is my attempt to make even one of the best parts of Halloween scary by naming it with the possible consequences of overindulgence...bwah-ha-ha-ha...! I love deviled eggs, and there are many ways to make them spooky. Dave & Wendy dyed the yolks and hand-painted veins on the whites with olive garnish to make these bloody Deviled Eyes. Wendy says the basic recipe is just as tasty without the bloodshot effect for other events, and is easily doubled for a larger crowd. Hardboil the eggs, slice lengthwise, and put all the yolks into a mixing bowl. Mash all ingredients except olives together with the cooked yolks and add food coloring until the yolks are the desired color. Spoon yolk mixture back into egg whites. Top each half with a sliced olive as the pupil. Dip a toothpick into the red food coloring and lightly draw "bloodshot" veins across the whites. 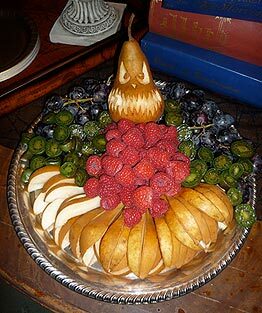 Arrange on a tray and serve to horrified guests. Wrap the pastry sheet around a small round of Brie cheese, sealing the raw edges together underneath. Use the leftover pastry scraps to add your own design to the top of the Brie, gluing on the pastry with water, milk or egg wash. Cookie cutters might give you inspiration, or roll your scraps into thin ropes and make a spiderweb design. Brush with milk or egg wash for nice browning. Place on greased foil on a cookie sheet and bake in the oven at 400F for 15 minutes, or until crust is golden brown. Serve with a spreader and your preferred assortment of crackers. You can leave your Brie en Croute plain which is still tasty, or you can add a layer between the pastry and the Brie if you like. My favorite is either my homemade spiced loquat jam, or apricot preserves with dried cranberries. Any large chunks of fruit make the pastry surface lumpy, so that could mar your design if your work is intricate. For the version shown with the white background, cut the slices of cheese into cracker-sized squares. Cut the orange cheese into jack-o-lantern shapes by hand, or use a miniature cookie cutter if you're lucky (I wasn't lucky, so I cut all of these by hand). Lay the contrasting layer on the cracker, then top with the jack-o-lantern slice. For 1999, I used a cookie stamp on melted American cheese while it was cooling in a flat cookie sheet. After it cooled thoroughly, I trimmed away the edges and had what you see above with the purple background. For 2006 I finally had time to use my mini Halloween cookie cutters to cut the cheese shapes into white ghosts, orange pumpkins and white skulls. Combine first 5 ingredients, spread on muffins, put on cookie sheet and freeze. When frozen, cut into triangles (eighths). Put in plastic bag, return to freezer. When ready to use, put under broiler until bubbly. Carefully mix just before serving, adding the butterscotch flavoring to the soda then stirring gently to mix well, or the fizz will dissipate too soon. To keep butterbeer on hand, pour 1 cup cream soda out of the 2-liter bottle, quickly add 1 cup butterscotch flavoring, and recap the bottle. Completely sugar-free and alcohol-free! now appearing annually for Halloween by popular demand! Carefully mix just before serving, adding the schnapps to the soda then stirring gently to mix well, or the fizz will dissipate too soon. To keep butterbeer on hand, pour 1 cup cream soda out of the 2-liter bottle, quickly add 1 cup butterscotch schnapps, and recap the bottle. I did make a refill batch using 1 cup schnapps to a whole 2 liter bottle of cream soda, which was ratio of 1 to 8, but people tasted the difference and complained, so fair warning! I have made several witches' brews throughout my Halloween history, but this one is my new favorite because of the snot-like brownish-green color and the huge foamy scum bubbles filled with fog that pop open with smoke escaping from the surface. From its disgusting appearance you'd never know it's just delicious lime sherbet, pineapple juice and ginger ale! Place a few scoops of lime sherbet into the cauldron or punch bowl. Pour in the pineapple juice and ginger ale in equal parts until the container is full. For safe dry ice, fill a large spice ball with small chunks of dry ice and place into the brew. 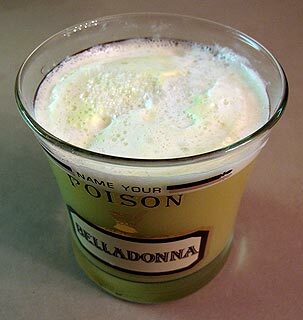 The carbonation in the ginger ale disintegrates the sherbet into scummy foam, the pineapple juice makes the brew opaque to hide the spice ball, and the foamy bubbles fill with dry ice fog that eventually pop, leaving wisps of smoke rising from the surface of your Bubbling Witches' Brew! This recipe fills a 12-quart cauldron. All measurements are approximate. Adjust to your own taste. Mix well. 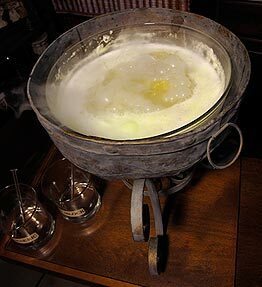 Pour into your cauldron, preferably with chunks of dry ice to create the bubbling steam effect. Be careful NOT to drink or eat or in any way come in direct contact with skin with any chunks of dry ice - you can get burned by the extreme cold! This is from my Laboratory Libations display as a recommended mad scientist experiment using existing bottled reagents. Individual serving alcoholic cocktail in a small glass. "To Reanimate Zombies: Into a small beaker, pour equal parts hydrochloric acid, perchloric acid, tincture of iodine & sulfuric acid. Add a splash of citric acid, stir and feed to your corpse for instant reanimation." "Spontaneous Sentience: Pour benzene into a small beaker. Slowly add lactic acid compound as your brain tissue appears, then carefully add the life blood extract to the brain tissue." One 9 inch pie crust, slightly cooked. (or 10 1/2 inch). Bake in hot oven (425F) for 15 minutes. Keep oven door closed and reduce temp to moderate (350F/180C) and continue baking for 45 minutes or until table knife inserted in center of pie comes out clean. Cool on wire rack. May be eaten cold or at room temperature and can serve with whipped cream. Cut the miniature pickles into fourths lengthwise, so that the pickle slices are still roughly the same length as the salami slices. Spread a thin layer of cream cheese on a slice of salami, wrap around a pickle slice and close with a toothpick. Make your sandwiches however you'd like, but try to have ingredients that will stick together and not fall apart after the sandwiches have been cut. The metal cookie cutters work best, since not all the plastic ones are as tall to cut through all the bread and fillings. For 1999 I used turkey and cheddar cheese, ham and swiss cheese (with just a little mayonnaise to moisten the bread), and herbed cheese spreads for my variety of sandwiches. I used a pumpkin cookie cutter for the ones shown above. Melt margarine in a large saucepan over low heat. Add marshmallows and stir until completely melted. Remove from heat. Add cereal and stir until well coated. Add the candy and mix until candy is evenly mixed. Spray a pan with non-stick cooking spray or line with waxed paper. Using a buttered spatula or waxed paper, press the mixture evenly into a 9x13" pan. Cut into squares when cool. It probably surprises no one that I have been a fan of Penn & Teller's brand of dark humor for years, so I had not only seen them in person including getting autographs, but also read their book 'How to Play With Your Food' (© 1992 by Buggs & Rudy Discount Corp.), so had seen their Bleeding Heart recipe and wanted to try it someday. I finally had my chance when I found a plastic human heart mold more than a decade ago at a specialty gift store around Halloween season. The mold came with a very similar recipe to make the gelatin opaque, but not any instructions to make it bleed, so I adapted Penn & Teller's recipe to create my own, and it has been one of my Halloween favorites ever since. You can find human heart molds online as well as at local Halloween stores. Penn & Teller used a Valentine's Day-style heart-shaped cake pan, but for Halloween I think using the human heart mold improves on their concept one-hundred percent! I display my heart on a crystal pedestal plate, then use food coloring and a small brush to accent the veins. I even use red food coloring to shade the muscle contours, since it really does make a difference. One year I had a cardiology intern attend my party, and she said my gelatin heart looked very realistic. Needless to say I was very proud at such high praise! I use my large Psycho-style butcher knife to sever and serve my Haunted Human Heart. Thoroughly wash your mold, especially all the detail where the veins are. When completely dry, spray the mold with non-stick cooking spray. Use a larger bowl or crumpled foil around the outside to support your mold so the top surface will be level. Put the flavored gelatin in a large bowl and stir in 1 cup of boiling water. Stir about 3 minutes until completely dissolved. When slightly cooled, stir in the evaporated milk for one minute, otherwise the milk might curdle. Pour half of the mixture into the heart mold and refrigerate until it is soft-set, as the box instructions recommend for adding fresh fruit. While the mold is setting, mix the corn syrup and raspberry syrup, plus raspberry liqueur if you like, with one drop of blue food coloring for a nice deep red blood color. Pour your blood into one corner of the thin plastic bag, squeeze the bag carefully to prevent air bubbles, then tie a knot so that the bladder will fit completely inside the rest of the mold, with enough space so gelatin will completely surround the bag. Trim the extra plastic off at the knot. Once the gelatin is soft-set and will support the bag of blood but without a skin on top of the gelatin, arrange the bag of blood, pour the remaining gelatin mixture up to the top of the mold, then refrigerate overnight. If you wait too long to add the remaining gelatin, the layers will not meld together, then your illusion is ruined when the top slides off the bottom, revealing your secret bag of blood! Once the gelatin is completely set, gently remove the heart from the mold and place on a serving plate, then use food coloring and a small soft watercolor brush to accent the veins. Use red food coloring to shade the contours of the muscle tissue, and blue food coloring to accent the veins. As you can see in the photo above, an unpainted heart is still alarming, but the accents make it so much more realistic. Refrigerate until the party, then display proudly, clarifying to all your guests that "Yes, that is our dessert!" When ready to sever and serve, call all your guests to come watch the Haunted Human Heart. Enlist a volunteer to hold a glass or bowl to catch the spilling blood. Using a large knife, the scarier the better, stab directly down into the heart, making sure you poke the point of the knife into the plastic bag of blood. Twist the knife to widen the hole in the bag, then guide the knife down to cut a slice through the edge of the heart. Widen the opening in the heart so blood begins to flow. Gently tilt the plate so the blood can easily flow into the cup in your volunteer's hand as your guests all groan in disgust. If anyone actually wants to eat a slice, be careful not to serve any chunks of the plastic bag, and be sure to drizzle extra blood on each slice. If you have willing bodies, feel lucky, since I often have no one willing to eat any of my heart except me! Penn & Teller's How to Play With Your Food© 1992 by Buggs & Rudy Discount Corp. The title says it all. It's the perfect coup de grace for your intimate dinner at home. As your guests sip their coffee, you unveil a glistening pink gelatin heart on a pedestal cake stand. Then you whip out a carving knife and stab it. Dark, gooey blood issues majestically from the wound. You cut dainty slices off the lobes of the heart and flip them onto dessert plates. You hold each portion under the oozing gash until it is nicely sauced with gore, add a dollop of whipped cream, and serve. or strawberry (redder; think of livers and hearts) gelatin dessert mix. Boil the water. Put the packaged gelatin dessert and unflavored gelatin in a bowl and pour the boiling water over it, stirring constantly. Cool to room temperature (very important or the next step may present problems). Stir in the condensed milk. (They mean the evaporated milk listed in the ingredients. This is an error in the original book. - Britta) Note how it already is acquiring the color of freshly skinned flesh. Pour the mixture into the gelatin mold. Cover the bottom of the mold (this will be the top when you serve it) with a layer about half an inch think. Refrigerate until it gels firmly. Meanwhile, prepare a nice bladder of blood. Stir together the corn syrup, grenadine, and food colorings (we do it right in the measuring cup to save dish washing--every erg saved in preparation is an erg one can use to enjoy the Payoff). For the bladder (the bag that keeps the blood together inside the mass of gelatin) take the gallon-size food-storage bag and turn it inside out. Pour the blood mixture into one corner of the bag and twist it closed so that no air bubble is caught between the sauce and the twist. Tie a knot in the twisted plastic. Adjust the position of the knot so that when the bag lies on the counter, it's about 1 1/2 to 2 inches high, and tighten the knot. With a pair of scissors, snip off the frilly extra plastic outside the knot. When the gelatin on the bottom of the mold is stiff and firm, position the bladder of blood in the mold, with the point of the bag just inside the point of the heart. Make sure there is at least 3/4" of space between all sides of the bag and the walls of the mold (this will ensure that your guests don't see clues ahead of time). Pour in the remaining gelatin until the mold is as full as you can handle. Don't worry if you see a little of the blood-bladder grazing the surface of the gelatin, as longs as it doesn't project too much; the side you are looking at now will be the bottom when you serve it. Refrigerate until gelled firmly to the texture of fine, lean organ meat. It takes about 4 hours. To unmold, put about 2 1/2 inches of hot, but not boiling water in your sink. Set your mold in the water so that the water comes just below the edge of the mold for 15 to 20 seconds; the time depends on the thickness of the mold pan. Remove the mold from the water, and run the blade of a knife around the edge of the gelatin. Invert your serving platter, ideally a white pedestal cake plate, on top and hold it firmly in place. Then use both hands to turn over the mold and the plate. Remove the mold; you may need to tap or shake the mold slightly to free the gelatin. The blood looks prettiest when it flows over white plates, doilies, and table linen, which it may stain permanently--but what the hell, it's the effect that matters. To serve, use a nice, big Psycho-style chef's knife and stab the side of the gelatin about one third of the way up from the pointed end of the heart. Twist the knife slightly, and blood will start to ooze out. Bare your teeth like a Marine jabbing with bayonet, and widen the wound. When the blood is coming at a good slip, grab a dessert plate, and cut a slice from one of the lobes of the heart. Flip it onto the plate, and drizzle it with blood by holding it under the edge of the pedestal. Add whipped cream and serve. Sight: red, glossy, and elegantly surreal when the blood starts to flow. Hearing: the screaming of guests. A NOTE ABOUT SAFETY: Be careful not to serve pieces of the food-storage bag to your friends. They could choke to death. We want to help you become a more exciting host, not a criminally negligent klutz. If, on the other hand, you're deliberately trying to murder your guests, please think up your own modus operandi. Don't try anything that might implicate a couple of innocent fun-book writers. We developed this with Jell-O brand gelatin dessert, Knox unflavored gelatin, Carnation unsweetened condensed milk, Karo syrup, Rose's grenadine, and Baggies food-storage bags. This is not product placement--we haven't received truckloads of free Jell-O; it's our attempt to use ingredients we know people can find easily in grocery stores everywhere. This is not to say that we'd reject any research and development supplies the abovementioned companies might graciously bestow now that we've given them such a big plug.